The booths set up by VIP gaming promoters at the inaugural Macao Gaming Show at Venetian Macao were hard to miss. Impressively big and luxurious inside, they resembled VIP lounges, not stands at a trade show. But junket operators differ on whether their investment in last month’s three-day exhibition has paid off. David Group’s Angela Ei says exhibiting presented a good image of her company and lured in new customers. “We are trying to attract more clients to join our membership programme. We want to tell people we provide a very comprehensive service, not only gambling, but which includes hotel rooms, transportation, et cetera,” she says. Ms Ei is in charge of the junket operator’s non-gaming services. Her company promotes several VIP gaming rooms in Macau casinos. A number of foreigners, especially Japanese and Koreans, visited the booth. “These people may not have known how our company really works before they came here,” she added. Hengsheng Group business development manager Ricky Tou says his company wished to present a good image and draw attention to its non-gaming services, ranging from organising cultural events to developing software. Hengsheng Group promotes 11 VIP gaming rooms in Macau casinos. He says it will soon have another gaming room, at City of Dreams. “We had fewer people than we had been expecting,” Mr Tou says. “We had been expecting at least 1,000 visitors per day at our booth, but we had fewer than 50.” Hengsheng Group’s booth was one of the largest in the show. It was staffed by ten or more people. “I don’t know if we will come back next year. I have to present these results to my boss first,” Mr Tou says. The organisers of the Macao Gaming Show said before the show that one of its strengths was having most of Macau’s main junket operators exhibiting. These enterprises bring high-rollers to Macau to gamble, and account for two-thirds of the city’s casino gaming revenue. Jimei Group exhibited, although its booth was smaller than those of other junket operators. The company’s marketing and VIP services manager, Crystal Chu, says: “We were expecting some of our gamblers to be here, as well as suppliers.” Ms Chu says Jimei Group will probably exhibit again next year. The Macau Gaming Equipment Manufacturers Association, which organised the Macao Gaming Show, issued a written statement after the show saying it had been a “resounding success”. 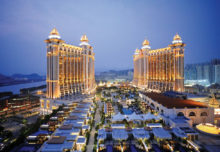 The association said all six of Macau’s casino operators had supported the show and the two-day conference that went with it. The organisers said the show had attracted 102 exhibitors and more than 8,600 visitors. The exhibition floor covered 7,887 square metres. Those figures make the Macao Gaming Show bigger than this year’s Global Gaming Expo Asia (G2E Asia). G2E Asia took place in Venetian Macao in May. The organisers, Reed Exhibitions and the American Gaming Association, let 7,087 square metres of exhibition space, and the attendance was 5,851. But G2E Asia had 139 exhibitors, more than the Macao Gaming Show. G2E Asia has never attracted many junket operators. But it attracts big international suppliers of gaming equipment. Some of these suppliers also exhibited at the Macao Gaming Show. Candy Tong is a marketing analyst in Macau for Bally Technologies Inc, a maker of slot machines in the United States. Ms Tong says her company intends to exhibit at both trade shows next year. G2E Asia is more international, while the Macao Gaming Show focuses more on Macau-based customers, she says. She had been expecting more foreign visitors at the Macao Gaming Show and would like to see more international customers next year, especially from elsewhere in Asia. Aristocrat Leisure Ltd from Australia plans to exhibit at both events next year. Regional marketing manager, Nathan Drane, says the Macao Gaming Show was a good opportunity to spend useful time with Macau customers. Mr Drane says the show was also an opportunity for his company, which has a subsidiary here, to get together with other Macau manufacturers of gaming equipment. Weike (G) Management Macau Ltd runs three slot machine establishments, which together have about 600 slot machines, and it has plans to expand. The company’s marketing manager, Chester Lai, says the Macao Gaming Show was an opportunity to promote the company. He says his company will decide whether to return next year after assessing its results from the inaugural show. Gaming equipment maintenance company Transcity Asia Ltd’s managing director, Chris Rogers, says the Macao Gaming Show is more cost-effective than G2E Asia. “We had good customers. The cost of the show was not as expensive as other ones. Next year we’ll be here again,” he says. Mr Rogers says having junket operators exhibiting so prominently made the Macao Gaming Show unique. The organisers should keep the junket operators coming back, but cut the show to two days, he advises. The Macao Gaming Show and G2E Asia overlap in many respects, and no enterprise wishes to exhibit in two annual trade shows in the same city, Mr Rogers says. He suggests that the organisers merge their events. The Macao Gaming Show will “get bigger and better” next year, he added. Mr Chun is also chairman of Paradise Entertainment Ltd, the parent company of LT Game Ltd, a Macau supplier of casino equipment. 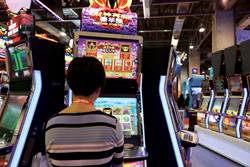 The on-going patent dispute between LT Game and U.S.-based SHFL Entertainment Inc, a rival company, flared up again at the Macao Gaming Show. The dispute is over the Macau patent for electronic multigame tables with a live dealer. On the last day of the show customs officials ordered SHFL to switch off and cover its exhibit of its Fusion Hybrid electronic multigame table.